In the previous study, we considered the work of the Spirit in the lives of the 12 disciples, focusing especially on the passage of time between the Lord’s resurrection and the Day of Pentecost – a period of 50 days. Despite earlier having been blessed with the Holy Spirit in order to preach and perform miracles during the Gospel period, the disciples had none of these powers in the time between the resurrection and the day of Pentecost 50 days later. When the Lord appeared to them for the first time after He had been raised from the dead, the disciples were probably bestowed with the authority to govern God’s people (He breathed on them and said, “Receive the Holy Spirit”), but they would have to wait a few weeks until the Lord had ascended and the day of Pentecost had arrived for the full enabling powers to be given to them. On the day the Lord ascended, the disciples were promised “power from on high”, that being part of the “Promise of the Father” that was spoken of in John chapters 14 to 16 during the Lord’s final Passover meal with them. This study is the first of four considering the day of Pentecost. Read Acts 1:4,5 … 8,9 portion - "not many days hence"
It's a rather significant event, as far as our studies on the work of the Holy Spirit are concerned. This is also a much misunderstood event, so it's worth the effort to stop, and learn a bit about what Pentecost actually was. And to find out about what Pentecost actually was, we need to know something about the festival (or "feasts") of the Lord that had been in place for well over 1000 years. Pentecost was one of the allocated holy days or festival days in the Jewish calendar. Our natural instinct is to read a Bible passage and say “what does that mean for me?” We want to apply the Scriptures to our lives. This is not a terrible thing to want to do, but how we go about it is important. We will make better applications of the Scriptures to ourselves if we take a bit of time to learn the background and setting of Bible verses and events. Let the Spirit speak through the Scriptures first, and then draw conclusions and applications to ourselves later. So, this study is a slight “detour”, a background study, as we focus not so much on the work of the Holy Spirit, but on the Feasts of the Lord, of which Pentecost was one. It will help you to refer to the accompanying chart as we go. What is a "feast" in this setting? It is not so much a banquet with tables full of food, but seasons in which certain ceremonies were to be carried out. The Hebrew word from which we get the English word "feast" or "festival" is moed, and really means "appointed seasons". These were holy days, festivals - occasions for sacred assemblies, as well as a number of other rituals to be carried out. Note that they are the Lord’s feasts, not Israel’s feasts. Festivals were not just for the priests, but for all the people to partake in, to some extent. We will start by looking at the weekly festival of the Sabbath, and progress onto the annual festivals after that. 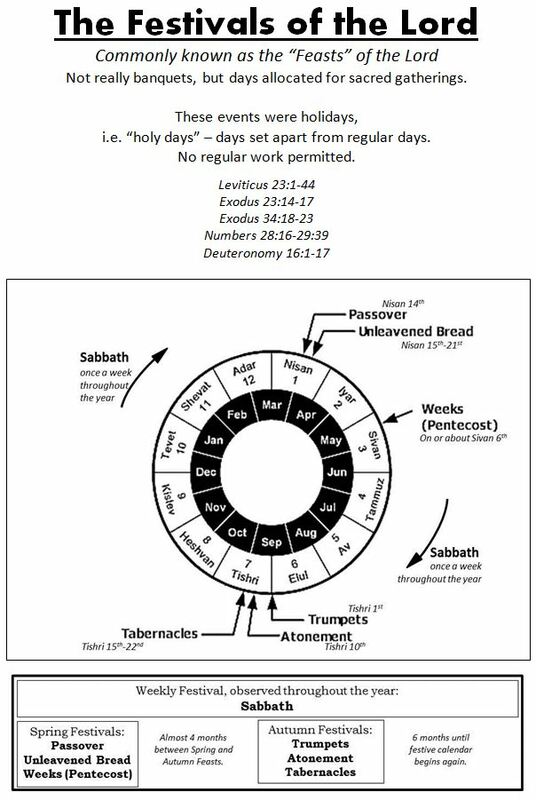 Refer to the bottom of the accompanying chart - Timewise, the remaining feasts are in two groups, each one coinciding with a season of harvest. Produce of fruit harvest (grapes, dates, olives, figs, pomegranates, etc). Not necessarily the firstfruits. The Civil year began in Tishri. The Ecclesiastical Year began in Abib (known later in Israel's history as “Nisan” once the people returned from the Babylonian exile). We'll now look briefly at each festival, to see where Pentecost fits. As we get to each one, we might be tempted to rush in and try to assign meanings to the symbolism within these ceremonies. However, let us apply good Bible study practice and first notice what is said, and put it in its setting. Later on we can try to apply meanings to these ceremonies. It will suffice to say for now that there is an allusion to God’s dealings with Israel's past and future in these festivals. Opinion is divided about this, but, there does not appear to be a separate festival called "Firstfruits". Rather, there was an offering which took place during the feast of Unleavened Bread, namely, the firstfruits (ie. the first gleanings) of the barley harvest. In a moment we shall see that there are firstfruits associated with the next festival as well. - At this time they were in the wilderness – they couldn’t grow anything there, and no one to buy supplies from (though some commentators believe the wandering Hebrews traded with various nomadic tribes in the wilderness). They were fed with manna, and occasionally quails, but there were certainly no crops to harvest during the 40 years of the exodus. Despite many editions of the Bible inserting a sub heading before verse 15, this festival is not given a title here. However, it is elsewhere – see Exodus 34:22 & Deuteronomy 16:10. Coincided with the time of the wheat harvest. READ v.22 There is a law inserted here, seemingly at random, about harvesting. Not random, but losely linked with the idea behind the festival. There is a lengthy gap of almost four months until the next set of festivals, which are all in the same month. Trumpets in Matthew 25, in 1 Thessalonians 4, and elsewhere. Note NIV footnote v.27 – “deny yourselves” (NKJV afflict your souls). Probably a fast, and definitely not a banquet or feast as we might think of it today. The only holy day of mourning, the rest were more joyful. (NIV say “branches” of trees, but should be fruit). v.42,43 – booths, and the reason. There we have an overview of the Festivals of the Lord. At the very least, some of them are commemorative (e.g. remembering the first night of the exodus via the Passover festival, acknowledging God's provision via the harvest festival of Pentecost, and so on). A number of people have suggested various interpretations of these festivals. Some have more credibility than others, and there may well in fact be more than one interpretation to the symbolism in these festivals. These might be right or wrong, or partially correct, which is what I suspect. Of course, God may have had a completely different meaning in mind. In the next study, I’d like us to focus more specifically on Pentecost, to see how the great outpouring of the Holy Spirit in Acts 2 has something to do with what was essentially a harvest festival.